The Boy Who Could Fly deserves to be recognized alongside E.T. The Extra-Terrestrial and Stand By Me as one of the best coming-of-age films of the 1980s. It’s that good. I gave director Nick Castle some grief in my last review of one his movies, 1984’s The Last Starfighter. I love that movie, but I have to admit it’s far from perfect. The Boy Who Could Fly was his next film, and he wrote and directed it, so I give him extra kudos for bringing such a near-perfect masterpiece into existence. This film mixes adult and childhood themes in a way that has rarely been done as well in other films. Pull up a windowsill and let’s explore what makes The Boy Who Could Fly a forgotten film gem. Anyone who’s been the new kid in school and has had trouble making friends will understand this movie. The main character is named Millie. Her family just moved to a new town and she’s struggling to fit in at school. She often looks longingly at the other kids who are having fun together, but she never has the courage to go up and try to talk with them. It’s not that anyone bullies her or is even rude to her, but the fact that they ignore her is disheartening and adds to her loneliness. The only boy she connects with is one who seems to suffer from autism. His name is Eric and he never speaks to anyone. But he finds other ways to communicate with Millie. The two of them become intertwined emotionally, and it becomes clear why when we learn that they both had parents die tragically. They’re searching for someone to help them overcome their deep psychological scars. This is all heavy stuff for a movie seemingly aimed at children. That’s what makes this movie so special. It was gripping for me to watch as a child because I related so much to what the characters were going through, but it’s even more amazing to me now that I’ve grown up and I can appreciate all the lessons I learned as a child. It’s like a time capsule that contains the exact moment when childhood ends and adulthood begins. Part of this movie’s charm is how it adds a touch of fantasy to the otherwise realistic story and it keeps you guessing about the fantastic elements the whole way through. I mean, the title is The Boy Who Could Fly, but you keep wondering if that’s just a figure of speech or if it’s literally true because the movie gives so many mixed signals. Millie has several experiences where she questions if Eric can fly or if it’s just all in her mind. It’s not until the climax that we finally get a definitive answer, but even then I sort of wonder if it’s still up to the viewer’s interpretation to decide what really happens. I’ll explain in the next section. The first day Millie goes to class, the teacher is talking about the tragic romance Romeo and Juliet. At the end of that story, the titular characters ironically kill themselves out of misplaced heartbreak. At the end of The Boy Who Could Fly, Millie and Eric are chased onto the roof of their school by authorities who want to put Eric into a mental institution. 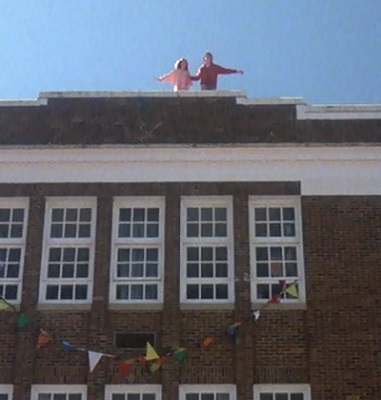 But the young lovers decide to risk their lives by jumping off the building and hoping Eric can actually fly. Everyone who sees them thinks they’re committing suicide. But, happily, it turns out that Eric really can fly, and he takes her to safety before flying away forever. Was the flight at the end wish fulfillment on Millie’s part, a la the ending of Brazil, or did it really happen? The film suggests that it did happen because of all the events that follow. Maybe it’s that I just re-watched Inception and I’m in a twist-ending mood, but I wonder if this is supposed to be a repeat of Romeo and Juliet or a redemption of that sad story. I love the homages this movie makes to Superman: The Movie. The tagline to the original Superman movie was “You’ll believe a man can fly,” and this movie is all about making you believe a boy can fly. The Boy Who Could Fly has an amazing scene in which Eric takes Millie on a romantic flight one night above the clouds. This is reminiscent of the famous flying sequence where Superman flies with Lois Lane high above Metropolis. It even has a moment when Eric lets go of Millie for a second and he catches her before she falls too far, just like when Superman catches Lois. My favorite nod to Superman, however, is the part where we see Eric sitting in the second-floor window of Millie’s bedroom and, without cutting, the camera looks away from him for a few seconds and when it turns back we see him sitting 20 feet away in his own bedroom window. How did he get over there so fast? This is just like after Superman’s and Lois’ flight when Superman flies off and, without cutting, the camera pans over and reveals Clark Kent rapping on Lois’ door. How did he get changed so fast? It’s pure movie magic in both cases. 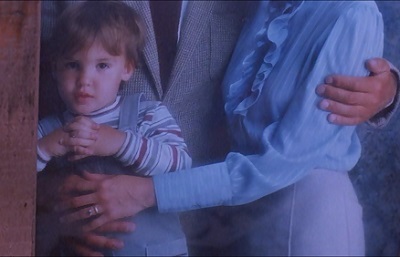 In both The Last Starfighter and this film, the little brother to the main character is named Louis. And both Louises have pretty much the same characteristics. They put on a tough front, but they’re also vulnerable at times. The Louis in The Boy Who Could Fly has a major edge over the other one, though, because he’s played by none other than Fred Savage. Before his winning roles in The Princess Bride and The Wonder Years, Savage starred in this wonderful film. He sure has a great track record of memorable performances. Louis’ language is coarse and he’s rather insufferable to his big sister, but somehow you can’t help liking the kid. Maybe it’s his love for his G.I. Joes or his brave quest to defeat the neighborhood bullies – whatever the case might be, I love all of his scenes. 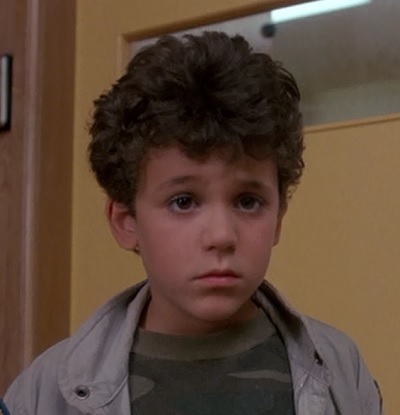 Fred Savage might be the best child actor of all time. This movie has several frightening scenes that left deep impressions on my young mind. The first one is when we see Eric being brought home from a mental institution in a straitjacket. He is struggling to get free and he looks like he is in absolute agony at his loss of freedom. I was a quiet kid, so, in my child’s mind, I was scared I would someday wind up like Eric. The second one is when Eric is being held against his will at a mental institution and Millie tries to visit him. He sees her from his window after she’s made an unsuccessful attempt to gain admittance to him and she’s leaving. Eric is beside himself with frustration at not being able to be with her, and you can see how desperately he wants to call out to her, but his vocal chords refuse to work. That’s the stuff of nightmares for a kid. 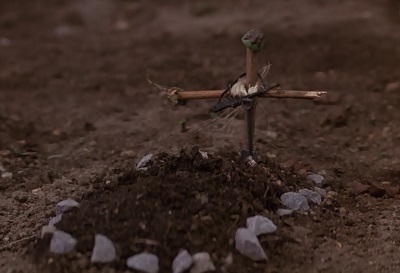 The third one is when Louis digs up his “dead” G.I. Joes that he buried in his yard. A huge rainstorm threatens to wash them all away and he’s so devastated by the thought of losing them on top of everything else that’s going wrong, he just snaps and decides he has to save them. I loved G.I. Joes as a kid, so this part hit me hard back then. It means something completely different to me now, though, because I understand that he’s coping with so many emotional problems that go far beyond his love for his toys. The Boy Who Could Fly is an incredible drama. It has the perfect balance between its comic and serious scenes to create something unique. It captures the sorrow of losing childhood while at the same time yearning for new grown-up adventures. Whether you want to remember what it was like to be a kid or you just want to enjoy a thought-provoking experience, you should definitely check this movie out. It’s not overly long and when you’re watching it, time just flies. 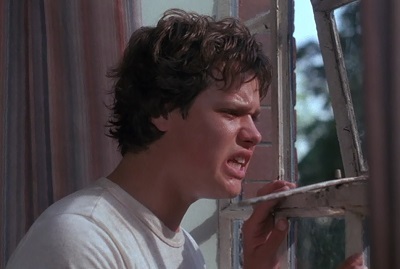 This entry was posted in Forgotten Film Gems and tagged 1980s, childhood, children films, comedy, drama, films, fred savage, last starfighter, movie review, movies, nick castle, relationships, romance, romeo and juliet, superman, the boy who could fly. Bookmark the permalink. Thank you for your post and remembering this excellent movie. One of my favorite scenes is when the mom (Bonnie Bedelia) comes home from a hard day at work (she was demoted from insurance officer to an administrative assistant or, as she puts it, a “glorified secretary”) and fights with her two children during dinner and sends them to their rooms. Each is having difficulties coping with the unexpected death of the father and adjusting to their new home and life. Eric, who was over for dinner, is left alone downstairs eating his pasta. When the mom goes up to check on her children, they hear the voice of the dad and come down to find out what’s going on. They find that Eric is playing an 8mm tape showing the dad and the family grilling and having fun together at the pool of their former house. While watching the old movie and remembering the good times they had a family, the mom and her two children embrace each other as they laugh and cry seeing and remembering their dad and how their life was. Very poignant scene filled with incredible emotions. I originally watched the movie a long time ago with my girlfriend whose mom had also passed away unexpectedly while she we were in college and she had some tears watching this scene since it brought up similar memories and emotions. I will also remember this film. Thank you.